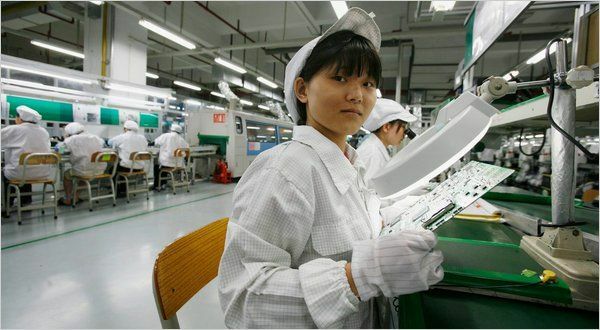 This morning a report from China Labor Watch accused a factory in Apple’s supply chain for a number of worker abuse violations. Instead of Foxconn or Pegatron, the factory in question was Jabil, a smaller Apple supplier in the Wuxi province. The undercover investigation found that Jabil was enforcing mandatory overtime beyond the legal limit, poor training, and hiring discrimination. Since the whole Foxconn scandal blew up last year, Apple has been much more public about its commitment to workers’ rights. In response to this most recent allegation against Jabil, Apple has said it is investigating the accusations. We are troubled by recent allegations related to excessive overtime, unpaid overtime, and working conditions at our Wuxi, China site. An audit team is en route to Wuxi to thoroughly investigate these claims. While we are aware of the desire of many employees to work overtime, our goal is to regulate overtime to achieve a consistently high level of compliance with Electronics Industry Citizenship Coalition (EICC) standards. Given Apple’s increasing scale of production and supplier footprint overseas, allegations such as these are unavoidable. Apple is very transparent about its auditing process and standards for suppliers, but there’s only so much it can do to prevent worker abuse. Some Mac production will start happening in the U.S. soon, but the majority of Apple’s supply chain is staying overseas for the foreseeable future.